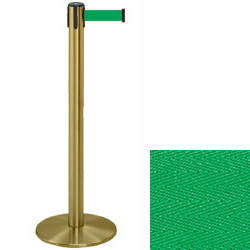 These brass stanchions with green belt feature bright coloration that will alert customers to where the line starts. Stands like these are great for for crowd control in a variety of locations, such as banks, restaurants, airports and retail stores. 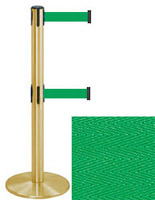 Each of the brass stanchions is made of durable metal and has a circular weighted base for extra stability. Each crowd control post comes with a boldly colored 7.5' retractable strap that measures 2" wide. 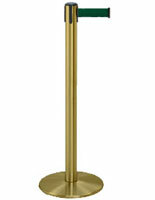 In addition, the stanchions for hotels and restaurants have a 4-way receiver for connecting to other fixtures. The metal stands feature a sleek satin finish that will match any environment.